Violetta young bedding set collection Violetta 160x200 and 140x200 cm for girls, towels and accessories with the new series from Disney Channel teen Violetta – telling the story of a young girl – endowed with an extraordinary vocal talent. A very popular series for girls talks about growing up musically talented girl, who after returning from Europe to his native Buenos Aires discovers the greatest passions, is looking for great friends and the love of his life. 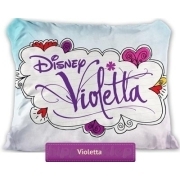 Bedlinen for teens Violetta in various sized 140x200 cm and 160x200, towels and accessories for girls with the character of Violetta is a great idea for a practical gift for any teenager.